This is a 3 bedroom 2 bathroom converted barn tucked away down a quiet country lane yet within easy reach of many tourist attractions. Recently extended, completely modernised and refurbished it will comfortably sleep six. Upstairs there is a large double bedroom with built in wardrobe and cupboard, a twin room and a bathroom with integrated shower over the bath. Downstairs there is another double bedroom, shower room with toilet and sink, a bright kitchen with oven, hob, microwave and washing machine. There is a large living and dining area with a TV, DVD player, games and books. The Barn is south-facing but for colder weather there is underfloor heating downstairs and gas-fired radiators upstairs. There is limitless hot water! It is in a very peaceful location with access to a large private garden and woods and a few paces from countryside walks. Guests are welcome to wander in the grounds but also have their own seating area. You are encouraged to inspect the vegetable garden and help yourself to anything that is ripe (depending on the seasons)! Maidstone, Tunbridge Wells, Cranbrook and Tonbridge are all less than half an hour's drive away and there are a vast number of historic sites and famous gardens easy to reach including Sissinghurst. Eurotunnel is less than an hour away if you fancy a day trip to the continent. The Simmonds family have lived at Den Farm Oast (next to the Barn) for 15 years now. We thoroughly enjoy meeting and greeting people from all over the world and helping guests make the most of their time in Kent. We are very relaxed about sharing our grounds and facilities with visitors and have many repeat visitors including regular ones from Australia and Germany. There is usually somebody at home to answer any questions guests might have. We have tried to make the Barn as comfortable as possible and take pride in its appearance. Having experienced a few dodgy self-catering holidays we know what we would like (or not like) to find in a holiday home inc. a comfortable bed(! ), plenty of crockery so you're not always washing up, good cooking facilities and a decent shower and bath to name a few! We fell in love with the property as we came up the drive. It is peaceful but not too remote, close enough to all the facilities but with plenty of space and virtually no traffic except the very occasional car or tractor. Den Farm Oast consists of part of a barn, 1 round roundel and one square roundel. The kitchen is round as is the master bedroom! The property is surrounded by orchards (beautiful in the spring) and hop fields. It is rural but so easy to get to towns either by car, bus or train. London is only about 50 mins away by train. The neighbours are all friendly, it is safe for children and great for walking and cycling. What more could we ask for! Den Farm Oast Barn is close by but detached. You have the choice of relaxing and enjoying the peace and quiet or hopping in your car and visiting one of the many famous sites around here including the Hop Farm at Beltring, Sissinghurst Gardens, Leeds Castle, Scotney Castle to name a few. A day trip to France is also easy to organise! We have received many compliments over the years but the majority have been about the peace and comfort of the Barn, the warm welcome visitors receive from the Simmonds, the pick and eat invitation as well as its close proximity to so many wonderful sights. The number of repeat visitors is a testimony to how hard we try to make this a memorable visit for everybody! There are many lanes here for cycling and footpaths for exploring on foot so plenty to do literally on your doorstep. This location is wonderful - in the middle of the countryside but very close to lots of famous sites and main line stations if you fancy a trip up to London. Bathroom 1 has a bath with a great shower over it. Bathroom 2 has a shower with a fold down seat. Underfloor heating downstairs and gas-fired radiators upstairs. The combi-boiler ensures limitless hot water. All towels (except for beach/pool trips) are provided. The living area consists of the sitting area and the dining area. The sitting area has a large sofa and 2 armchairs, a TV with freesat and DVD player, plus radio/CD player. There are plenty of books to borrow and some board games. There is plenty of everything but if you can't find something specific please ask! The kitchen is light, airy and well equipped. It has an electric oven and hob, extractor fan, microwave, toaster, kettle and washing machine. The table comfortably seats 6 people and a high-chair can be provided on request. We are happy to lend CD's on request. Feel free to borrow, take with you if unfinished and leave any you no longer want! A few board games and jigsaws are available. We have a large garden, a vegetable garden and private woods. There is a private seating area for the barn but guests are welcome to use the main picnic table and other seating areas in the garden. Downstairs is wheelchair accessible except for a low step up to the front door(we do have a portable ramp which can be used). Doorways are wide enough for wheelchairs to pass through. There is a seat in the downstairs shower but a small step up into the shower so not suitable for all wheelchair users. Notes on accommodation: The accommodation is light, airy and comfortable. We pride ourselves on making your stay as comfortable as we would like it. If guests need anything they only have to ask. The gardens in summer are well stocked with fruit and veg and there is always a selection of home made jams and jellies in the kitchen on arrival along with 1/2 dozen "home grown" eggs (if the hens are co-operating). In the living area there are pamphlets on the many places to visit, along with an A-Z mapbook of Kent, a wide selection of books, some games and DVDs. Feel free to ask if you would like to borrow further DVDs or games. Outside: The Barn lies within 14 acres of garden, woodland and fields. There is plenty of outdoor furniture as well as a picnic table. Behind the barn is a large vegetable garden and past the stables (no horses!) there is a large greenhouse. Guests are welcome to help themselves to any fruit or veg which is in season. There are also hens providing eggs for everyone (usually!). Children are free to roam but are the responsibility of the adult guests. The garden backs on to a very quiet lane and access to more fields and footpaths. Across a brick courtyard is Den Farm Oast where the hosts live and are available to answer any questions visitors might have. Cleaning / Towels / Linen / Maid service: All linen and towels are included. They are changed weekly. It has its own hoover and other cleaning equipment for end of stay tidy ups as well as washing up liquid & soap powder. We are 3 generations of the same family aged from 27 to 93. This cottage suited us perfectly. 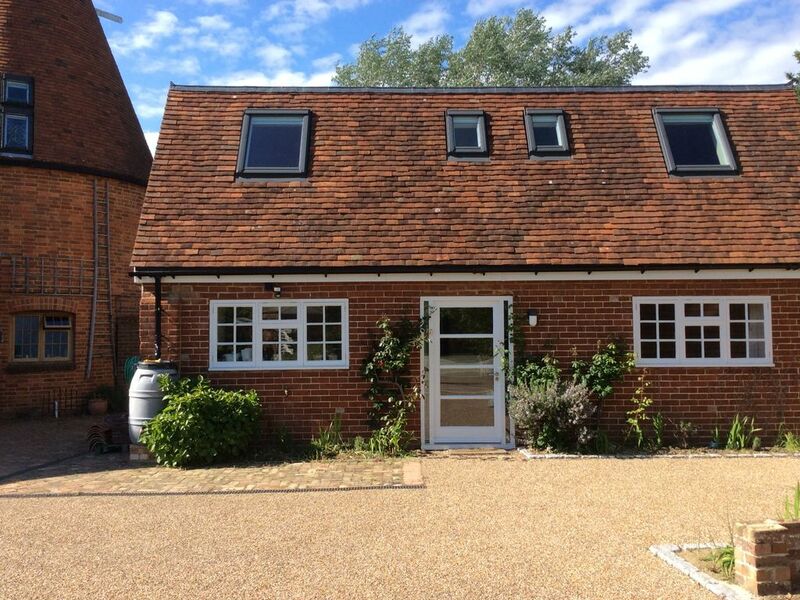 It is situated in rural Kent within easy reach of the M25 and other major routes. There is a downstairs double bedroom and toilet/shower. Upstairs there is a twin room a double room and a family bathroom. The property is superbly maintained and has everything you could possibly need. The lovely owners live in the adjacent house and are on hand for anything you may require. They are genuinely concerned that everything runs smoothly for your holiday and they both made us feel very welcome. Around the barn there are woods and grassy areas and also lots of home grown produce which you are invited to use if you wish. All in all a wonderful well run welcoming rural retreat suitable for all the family. Thank you for your kind words. It was a pleasure to have you as our guests! Had a great holiday despite some health problems and the extreme heat towards the end of the heatwave! The cottage was ideal - well appointed, comfortable and with everything you could need. Loved the fact that you could use produce from the owners garden and greenhouse. Highly recommended. You were lovely guests and I’m so glad your mother got to visit old haunts. It WAS the hottest week of the year (so far) - I’m amazed you achieved as much as you did. Come back and enjoy the cooler weather another time! Nice converted barn,modern, clean & roomy. We had a fantastic time here. Great location to access London, Kent Countryside & South Coast. The converted barn was modern, clean & roomy. The owners,Liz & Paul, live next door and were very friendly & welcoming, as was Elvis the Labrador. They provided us with some nice preservatives, eggs, tea, coffee, milk etc. on our arrival which was very nice. The only thing missing was a nice outside area (specifically for the barn residents) where you could sit on an evening enjoying a beer or glass of wine. Lovely house in a beautiful setting. Spacious, well equipped house with everything we needed for a holiday. Provisions were provided on our arrival & bedding & towels were of a high standard. Fresh eggs and fruit were freely available & delicious. A perfect setting to explore the South East of the UK. We traveled easily to London & Thorpe Park from here. Thank you. It was a real pleasure to have you to stay! Wir hatten eine wunderschöne Woche in diesem super ausgestatteten Haus. Liz und Paul waren immer hilfsbereit und standen mit Tips gerne zur Verfügung. Außerdem versorgten sie uns mit eigenen Eiern, Marmelade und frischem Gemüse aus dem Garten. Es ist ein idealer Platz, um das wunderschöne Kent zu entdecken oder auch einmal einen Kurztrip nach London zu unternehmen. Wir kommen ganz sicher wieder - vielen herzlichen Dank !! Our nearest major airports are London Gatwick (45 mins) and Heathrow (1hr 15) around the M25. Dover port is 1 hour away. Whilst this is a good area for cycling we recommend you have your own car in order to be able to visit the sites in the surrounding areas. There is only a limited local bus service and the nearest train station is 3.5 miles away. Yalding (2 miles) has a minimarket, library, post office, pubs, an Indian restaurant, cafe and a lovely walk along the river. Marden (3 1/2 miles)boasts most of the above plus a "Chippy", a Curry House and farm shop. Both have medical centres. There are some lovely walks throughout the area and we do provide some walking guides. Paddock Wood (6 miles) is a small town with a lovely old-fashioned department store, a Waitrose, many other shops and a small leisure centre. There are too many places of interest to list them all but we are blessed with many gardens including Sissinghurst and Penshurst Place, a lot of historical buildings eg Leeds and Hever Castles (both of which deserve at least one full day), Scotney Castle is close by. There are entertainment venues including the Hop Farm and Kent County Showground at Detling Hill. Also Maidstone, the county town, Cranbrook and Tonbridge all boast large leisure centres with swimming pools. The long sandy beaches of Camber Sands are about a 45 minute drive away and there are some lovely, more pebbly, little bays on the north coast such as Botany Bay. There are plenty of fishing lakes, golf courses, shopping centres (including Bluewater - 45 mins drive) and if you don't feel like driving far then there is a local train station at Yalding and main line at Marden and Paddock Wood. Maximum stay of 28 days at a time as stipulated by Maidstone Council.